Apparently, it’s been over a year since I wrote about a food book (it was French Kids Eat Everything, last August). This is not right. I THINK I’ve probably read some food books between now and then, but now I can’t be certain. It appears that if I haven’t documented something on my blog, I have zero ability to recall it (ah, Goodreads tells me I read American Wasteland in January and Garlic and Sapphires in March. Thank heavens for Goodreads). That’s enough about my failing memory. 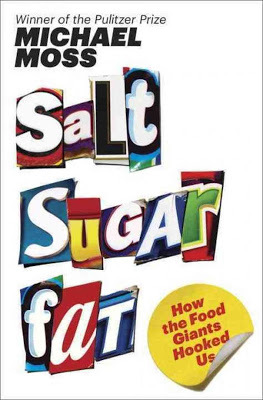 Let’s talk about Salt, Sugar, Fat: How the Food Giants Hooked Us instead. Because it’s a REALLY good food book. I’ve been meaning to read it for ages, and when Definitely RA recommended it on my recommended audiobooks post, I pulled up my library’s audiobook download page and immediately checked it out. And then I couldn’t stop listening. Basically, this book covers all of my favorite topics – food and nutritious, business and marketing. The book isn’t trying to convince you that processed food is bad for you (it basically assumes that’s a foregone conclusion). It’s more a book about why the foods at the grocery store are made the way they are and the market forces that have led them to look that way. If you were wondering if money is the bottom line here? Yes. Money is the bottom line. This book is jammed with interesting stories and facts, and I kept repeating them to anyone who would listen (poor Ani. She probably wished I would just stop talking and let her nurse in peace). For instance, whole milk started getting a really bad rap a couple of decades ago, and low-fat and skim milk was really getting pushed. But cows, obviously, only make whole milk, so suddenly there was this enormous surplus of milk fat (and there’s a whole lot about government subsidies and how that played into this), so, hey, cheese! Except, people mainly ate cheese as an appetizer or after-dinner thing. So the cheese manufacturers did something brilliant – they turned cheese into an ingredient. Now it wasn’t just something to eat by itself, it was something to make part of a dish (later on, the beef industry adopted this same strategy). And did you know that although humans love the taste of sugar, we only like it up to a certain point? At some level of sweetness, it gets too sweet for us and we’re just not interested anymore. But fat? Especially fat mixed with sugar? Humans basically have no limit on how much fat and sugar they’ll enjoy (so. . .guess what food manufacturers like to pump their products full of?). Also, healthier versions of products, when done right, actually INCREASE sales of the original product. Much like adding salads to McDonald’s menus increased the number of Bic Macs they sold – the fact that you HAVE a healthy option makes you feel like you can choose the unhealthy option this time, because next you could, theoretically, pick the low-sodium, reduced-fat, multi-grain variation. I could go on and on, but I won’t, because you should just go read this book instead. It’s ridiculously interesting and it doesn’t have the gross-ness factor that some books have. It did, however, make me feel a little guilty about the box of Poptarts I had in my cupboard (sale+coupon+brown-sugar-cinnamon = impossible to say no). And I won’t lie. Even knowing how much cutting-edge science went into making them hit the bliss point didn’t make them taste any less delicious. I love books on food! Especially everything written by Michael Pollon! And now, Wisconsin has found another way to use cheese! I heard on Wait, Wait, Don't Tell Me that they are going to be using cheese brine on their streets this winter. Oooh I'm totally requesting this book from the library. Thanks for the recommendation! I read American Wasteland this summer and am now obsessed with eating every single thing we buy. It's led to some creative meals, that's for sure. I really liked that book and found it very interesting. And I also spent the weeks after I had read it telling anyone who would listen all about how companies work to make us want to eat their food and particularly the tale of cheese! I can't fathom a world where cheese is not a main ingredient. We have a friend who doesn't like cheese and we could never have them over because I couldn't come up with a single thing to make that didn't involve cheese. I have a problem. Ah, Brown Sugar & Cinnamon Pop-Tarts. I probably only buy them once a year, but the splurge is so nice. Love this post! I was a huge book worm up until I got married… now I never read. I know it's really sad! I've really been wanting to get back into it. Strangely enough this is right up my ally with the interesting factor. I'm sure I'll read it and try telling my hubby all about it, and he probably will laugh that I find it all so interesting. I, too, love nutrition/marketing books (obviously). I, too, have been meaning to read this for ages. I, too, didn't think of an audiobook for it and immediately went to my library site after reading this post. And…the device is disabled. What?? Crushed. Will just have to wait in line for the kindle book. Also, just this post is making me feel smug about drinking whole milk, so heaven help anyone around me when I actually read the book. this book falls into the category of "i check it out from the library and never got around to reading, so now it's one my hold list for the umpteenth time." i think i need to audio verions of nonfiction b/c i have a harder time wanting to pick those up and actually read. That book made me so hungry. I mean, you can only say Fritos so many times before I have to have some. Love your blog, found you through Merrick and now you two are my one sided blog friends…. you know. So I was wondering if you could do a blog post on how to download audio books from the library or other free places. I know it is one of those things that is super easy but I'm still on the "I feel like an idiot because this is hard/impossible side." Thanks in advance if you do have time to clear this little issue up! This looks fascinating. And yay! My library has it. Also, Tracy's comment above? I second that. Should be a straightforward thing, but I've never done it, and so I keep checking out paperbacks and taking 10 years to get through them. I'd like to start listening to audiobooks on my runs, though. And I'm with Preethi. We drink lots of whole milk around here. As in, I go through an entire gallon by myself (T won't touch it) every 6 or 7 days.